We are the Alumni Council of the Gamma Epsilon (ge) Fraternity and the Gamma Lambda Epsilon (gle) Sorority, Beta (b) Chapter, University of the East (Claro M. Recto Avenue and Samson Road Campuses), Philippines. Beta Chapter was established at the College of Engineering of UE immediately after the founding of the Gamma Epsilon Fraternity at the University of Santo Tomas (UST - Alpha Chapter) in 1963. The chapter's sorority (Gamma Lambda Epsilon) was established in 1966. The chapter gradually spread to other colleges of the university when some members shifted courses. In the 1970's, Beta Chapter became a university-wide Fraternity and Sorority. Members of Beta Chapter also recruited students from other colleges and universities, specifically around and near the university belt area. 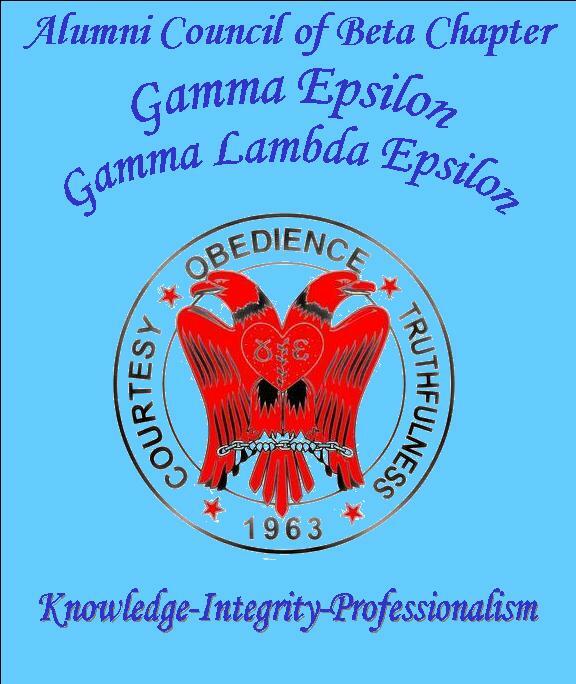 This paved the way towards the establishment of other chapters of the Fraternity and Sorority. During our active years in Beta Chapter, we stood firmly for the three (3) principles of the Fraternity and Sorority - Courtesy, Obedience and Truthfulness. As alumni, we still espouse the same principles, and have, in fact, enhanced them by incorporating three (3) more principles - Knowledge, Integrity and Professionalism. We are in different fields of specialization in many regions of the Philippines and the World (most of the officers and members of the pioneering batches of Beta Chapter are in the United States of America), performing service to God, country, family, the brotherhood and sisterhood of Two Headed Eagles, and our fellowmen. Nada es imposible y todo es posible!